TATSUMI celebrates the life and work of Japanese comics artist Yoshihiro Tatsumi-a manga pioneer who elevated the genre to a new level of creative expression and adult realism. 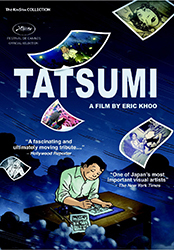 A comics-crazed teenager, Tatsumi began to get published and was able to support his poor family in postwar occupied Japan. He finds even greater inspiration after meeting his idol, the famous Disney-esque animator Osamu Tezuka. But despite his success, Tatsumi became dissatisfied with making whimsical children's comics. In the late 1950s, Tatsumi coined the term gekiga (dramatic pictures) and redefined the manga landscape with an alternative genre for adults. Realistic and disquieting, his work began to grapple with the darker aspects of life in his rapidly changing country-with stories that are perverse, shocking and darkly comic. A tribute to an artist who made comics cinematic, filmmaker Eric Khoo's (BE WITH ME) inventive animated drama brings Tatsumi's memoir A Drifting Life and five of his classic stories to life. It is the end of summer, 1989. Alois Nebel works as a train dispatcher at a small railway station in the Sudetenland, a mountainous region on the Czechoslovak border.